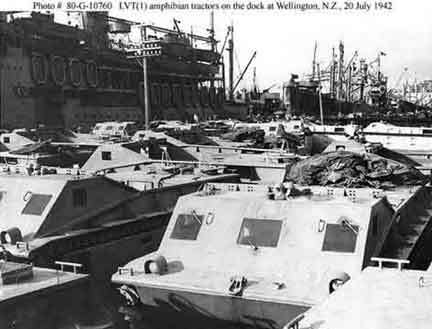 ABOVE: LVT(1) Alligators waiting on the dock at Wellington, New Zealand, 20 JUL 1942. 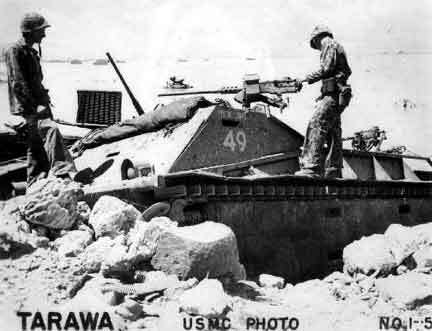 ABOVE: LVT(1) Number 49, "My Deloris" at Tarawa. Notice the metal plates that have been welded over the front and side windows of the cabin. 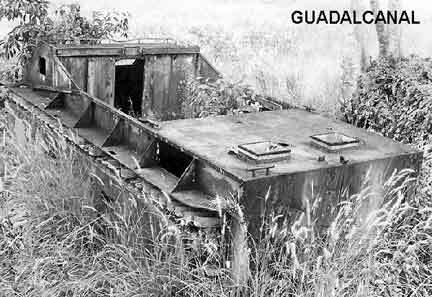 This field-modification was done to most of the Alligators, in New Zealand, after Guadalcanal and before Tarawa. 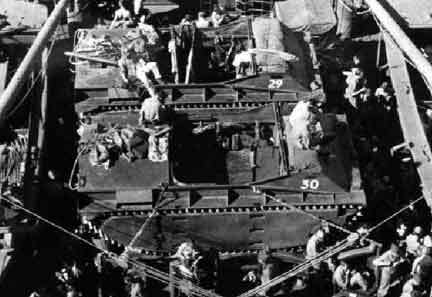 ABOVE: Two Alligators on the deck of the USS Monrovia, before Tarawa. ABOVE: This modern photo, from Guadalcanal, provides a good view of the cabin entrance. The LVT(1) has a flat-blade track design and the LVT(2) has a double-cupped track design. The track-types can be seen in many of the Green Beach photographs. The LVT(1) was powered by a “straight-six” six-cylinder engine, similar to those found in automobiles or trucks.The LVT(2) was powered by an air-cooled, 7-cylinder radial engine, an unusual type normally found in aircraft. The LVT(1) was significantly smaller than the LVT(2). The LVT(1) had a displacement of 16,900 pounds and LVT(2) had a displacement of 25,200 pounds.